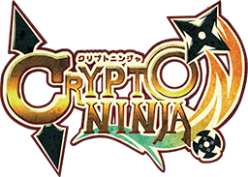 Here, I will guide you on how to play CryptoNinja ! Okay, first, there are mainly two actions you do in CryptoNinja. One is Attack and the other is Guard! To attack, you need to deploy your own Ninja to sneak into other players’ castle and get the treasure, EverGold (EG)! To guard, on the other hand, you need to customize your castles by setting traps, and drive other Ninjas away! Ninjas and Castles are created by blockchain technologies so that they will never be illegally deleted nor stolen! Isn’t it wonderful? Do you have your IOST account and iWallet yet?? If not, see the link below and create one! 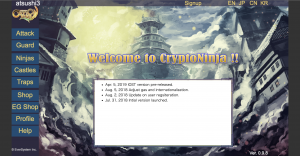 ・Sign up to CryptoNinja with your user name. Click the “Signup” button on the top menu bar, and sign up. ・By the EG, you can purchase Ninja, Castle, and Trap. ※To buy EverGold, choose amount and click the【Buy】button, then iWallet page appears. Click the confirm button to confirm your purchase. ※To buy Ninja or Castle, choose amount and click the【Buy】button, then iWallet page appears. Click the confirm button to confirm your purchase. ※It takes a while for results of purchase to be shown on the game. Please do not click the BUY button many times to avoid any unwanted purchase. We cannot reverse any purchases. Deploy your own Ninja to sneak in to other player’s castle!! then you will reach the page to decide the path to the treasure. With the arrow button, you can make your route and decide. 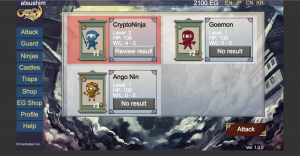 After a while, you can see the result of Attack by clicking “Review result” button in “Ninjas” page. 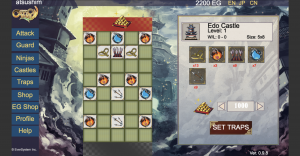 ※When Attack, you use your EG. The amount is the half of EG hidden in the target castle by the owner. You can get the EG back if the attack succeeds. When your Ninja gets to the depths of the castle, the attack succeeds! 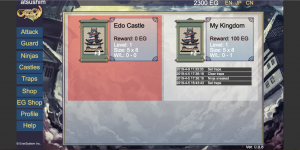 You will get the EG you used to attack and also you found in the castle. Customize your castle with varieties of traps and drive enemies away!! Decide where to put traps and amount of the EG, then your castle will be on the list from which other players can choose the target castle. When other players choose your castle as the target of their attack and traps successfully make them fail, you can get the EG that other player used to attack, which is half of the EG you placed in the castle. Ninjas wear various clothes. Every time you purchase Ninja, you will get Ninjas with different clothes. Each Ninja and Castle has its own number. Even if some Ninjas have the same appearance, each of them has different number so that there are no two completely same Ninjas. Ninja gets experience points by every Attack and so does Castle by every Guard. Not only successes but also fails make you stronger. By earning experience points, the level of Ninja and Castles gets higher. Ninja’s HP increases and Castles’s traps gets more power. Above certain level, Ninja obtains a type. There are three non-type traps and five type traps. Non-type traps are Arrow Trap, Bear Trap, and Spear Trap. Strength : Arrow < Bear < Spear. Type traps are Wood, Fire, Ground, Gold, and Water. Basically each of them hits the same damage, but there is the type effectiveness relationship. 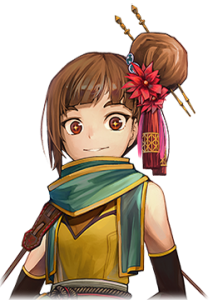 When a trap has the effective type over the type of Ninja, the damage becomes greater and when a trap has the ineffective type, the damage becomes smaller. Did you get how the game works?? Right, this is my last advice. Collect EG! Sneak and grab by Attack? 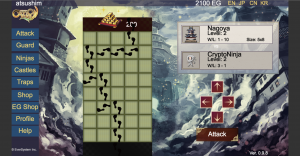 Beat invaders with traps by Guard? Choice is yours. I’m waiting for you anytime in CryptoNinja! If the page doesn’t work properly, please reload the page. In case you find some problems, please notify us. Please be aware that, due to its nature of Blockchain system, it may take a moment for the result of transactions to be actually shown on the game. ※We will not be responsible for problems which happen on third party applications.